Mt Bromo Midnight Tour, Water Rafting package is one of 1 night 1 day trip start at night time to enjoy the Sunrise, crater and popular rafting in Probolinggo East Java Island. the trip will start at night from Surabaya or Malang. Around at midnight time at 10.00 - 11.00 PM, Our driver will pick You up from your Hotel, Airport, Train Station then start enjoy Mount Bromo midnight trip, and Water Rafting until finish at Surabaya again at 07.00 - 08.00 PM. Mount Bromo trip night begin at 23.00 PM – 00.00 AM, Our driver will meet You in Surabaya, Malang then drive You toward the Jeep parking at Sukapura Cemoro Lawang for 3 hours. For photographers who interested enjoy Milky Way tour at Mount Bromo, very recommended to start at 09.00 PM. Finish enjoy the Sunrise, Return to your jeep, Afterward, continue to Sea of Sand to see the crater views. From jeep the parking lot on the Sea Sand, start Mount Bromo trekking package for 30 minutes, You can also take the horse ride for 15 minutes. Finish information, The Costume ready to used then take you to Ranu Gedang using Pick Up Car for 30 minutes. Arrive in the Rafting location at Ranu Gedang Pekalen river, Start Songa Rafting adventure accompanied by special Rafting guide (The Rafting adventure will spend 3 hours duration). Along the Rafting, You will stop for taking picture front of the views of Waterfall, Bat Cave and some other waterfall views will seems clearly. 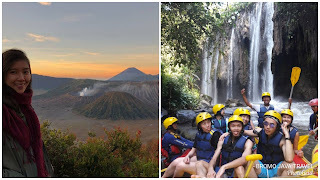 03.00 PM, Finish enjoy Mount Bromo tour package and Songa Water Rafting, Return to your location request at Surabaya, Malang or Banyuwangi and finish Mt Bromo midnight, Rafting adventure. Before You take Mount Bromo and Rafting tour, You must bring complete clothes like Jacket, Gloves, Hat, Long Pants and Trekking Shoes in order You can make adaptation on the highest peak due to the temperature around 03 - 05 degree centigrade.